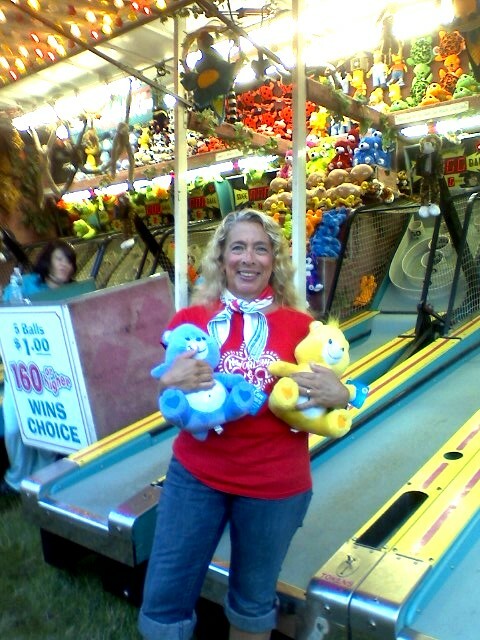 Laurie took three tokens worth of practice Sunday night at the carnival on the town common. The crowd swirling around included the usual town suspects, clouds of teenage girls, swaggers of teenage boys, mothers struggling with strollers in the grass criss-crossed with electrical cables overlain with rubber doormats. Last night we went back to the common and I got Laurie five tokens for Skeeball. In the 24-hour hiatus, she had apparently been thinking about her lack of success on Sunday when her high game had been 110 points. The minute the token fell and the balls were released, she went into her old-school stance and concentration, right arm holding the ball high in front of her while she visualized the coming launch of the ball. Five balls snapped off in rapid succession, she waved to the attendant, pointed to herself and mouthed, “I won!” For which she received a rather tired nod, and in a brief consultation Laurie was told that she could only win twice – but if she did win again before she ran out of tokens, they would be repurchased. Five more balls, 160 points, another win. Two stuffed bears and three dollars were exchanged for the remaining three tokens and a most pleased smile broke out on Laurie’s face. She strolled the rest of the evening cuddling a bear in each arm.